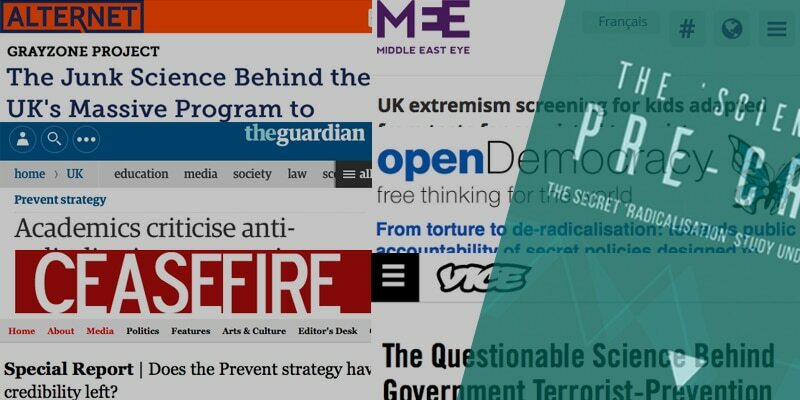 Last month CAGE published its report “The Science of Pre-Crime” which for the first time tackled the underpinning basis of PREVENT, the secretive Extremism Risk Guidance 22+ (ERG22+), a series of factors used to refer individuals to security services under Channel and PREVENT for being at risk of “radicalisation”. Our report showed the ERG22+ to be based on unreliable ‘scientific’ studies. The report was also accompanied by a robust joint letter signed by over 150 academics calling on the government to publish the studies that gave rise to the ‘ERG22+’in full, since this is essential to establish just how scientific – if at all – the secretive evaluative method really is. Following our report, it emerged that individuals at the heart of the Home Office’s public relations arm RICU had worked for Bell Pottinger, the firm that worked for the American military to produce “hearts and minds” propaganda in Iraq. The link between RICU and Bell Pottinger could not be more illuminating. 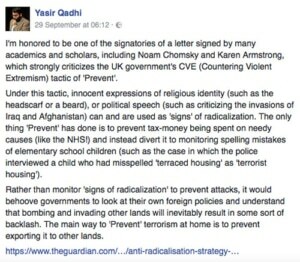 It is now clear that much of the discussion surrounding PREVENT has been engineered using tactics borrowed from the counter insurgency propaganda in Iraq, and it is a very real possibility that Muslims in Britain are being viewed through the same prism as insurgents in Iraq – with a war-like mentality. It is no surprise then that probing questions about PREVENT and its origins have been met by secrecy, misinformation and half truths. Our report has sought to undo this secrecy and present the baseless foundation of the PREVENT strategy. 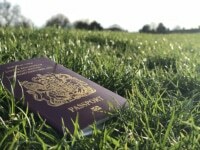 The reaction to the report has been mostly positive, with many key voices acknowledging the need to scrap PREVENT, and with its main proponents issuing statements ranging from the contradictory to giving a false impression of the policy. This was a victory for CAGE, in that we saw many of our opponents falling back on weak arguments, coordinated it appears by RICU. Since PREVENT provides the ‘best practice’ example for Countering Violent Extremism programmes in other countries, our report was also mentioned in reports in the United States, where there is a strengthening anti-CVE body of organisations. We also shared the report with our affiliates in other countries where CVE programmes are being adopted rapidly and often without grassroots support. We hope that with this report, the UK’s ‘way of thinking’ and ‘good practice’ will be challenged on a global level. Here, we summarise the reaction to our report, coverage and its impact. The Home Office, which is the only authority that can conclusively set the official line preferred to skirt around the issue. They issued a regular response outlining very briefly that the report had in fact been “peer-reviewed” and “published in two publicly available academic journals”. The Home Office continued to claim that the study “informed part of the process used by independent experts to assess a person’s vulnerability to being drawn into terrorism”. These claims were also echoed by the Security Minister Ben Wallace. Monica Lloyd, the author of the original study, contradicted the claims by the Home Office by saying the study was “not an academic piece of work”, but instead an internal report at NOMS. Although the Home Office says the process is used by independent experts, in reality it is being taught to hundreds of thousands of non-experts obliged to apply PREVENT after meagre training. The actual peer reviewing process is still shrouded in secrecy, with numerous academics criticising the study and the authors conceding it has numerous flaws and lacks predictive validity, the exact opposite to which it is being used. The “academic journal” Assessment and Development Matters published by the British Psychological Society in which a summary of the ERG22+ ‘study’ was published was in fact only a magazine distributed to psychology practitioners – and there is no peer review process involved at all. Both academic journals published summaries of the ERG22+ study. A peer review process requires that the original study and data are evaluated by a group of independent experts, but the second journal did not specify whether the original data had been reviewed in its entirety, nor did it make any allusion to this process. Monica Lloyd, the author of the ERG22+, herself highlighted problems with the validity of the ‘study’, saying that it was “not an academic piece of work”, but rather was an internal report for practitioners. The government may not only have manipulated the concept of a peer review process – which threatens the integrity of scientific enquiry itself – but it has also based its PREVENT programme on what appears to be nothing more than a non-peer reviewed internal report. David Anderson QC, the outgoing terror watchdog, has not commented on the basis that PREVENT is not within his remit as independent reviewer of terrorism legislation. However in a recent intervention Anderson admitted that Muslim communities feel PREVENT targets them and has lost their trust. PREVENT practitioners and supporters repeated the claims of the Home Office, and responded with the same line of criticisms. It was suggestive of a coordinated response, controlled by RICU, the secretive government department responsible for the consistency of messaging on counter-terror and counter extremism. The regular ad hominem attacks were expected but beyond that it seems there were two distinctive attempts to play down the importance of the report. The first was to insist that the report had the academic credentials it boasts it does. This was paired with the dogged insistence that PREVENT was in no way inspired by the ERG 22+, the study underpinning the government’s counter extremism strategy. The second was to divert the discussion away from the contentions the report raises by asking questions about alternatives or the need to “safeguard” vulnerable individuals from extremism. These points, which we contest, do not address the concern that the current framework of the counterterrorism strategy, is founded upon unproven and untested ‘science’ – and that the implications of this for society, and for true scientific enquiry, are serious. More importantly PREVENT supporters have had to concede that the programme has many flaws. Maajid Nawaz, writing in his new role for the Times of Israel, declared that PREVENT’s main problem was in its name. Nawaz suggested a remedy would be to rebrand PREVENT – to ‘Engage’ – and to change the troubling “opposition to British values” to “opposition to the more universal liberal values”. Besides broadening the reach of such a policy, Nawaz really failed to acknowledge that the entire premise of the programme is fundamentally flawed, preferring rather to dwell in the realm of semantics. Furthermore, the report prompted first time admittances from Inspire’s Sara Khan that their project, Making a Stand, was supported and funded by the Home Office, after having initially denied any external influence. Much of the reaction among PREVENT proponents attempted to steer the conversation away from the audaciousness of government building a programme on flawed ‘science’ and the implications thereof, to asking for alternative solutions – to which CAGE outreach director Moazzam Begg penned this article. The right wing neo-con think tank, The Henry Jackson Society compiled a report entitled “Myths and Misunderstandings: Understanding Opposition to The Prevent Strategy“. In it, they had to concede that there has been an “organised campaign to see the Prevent strategy scrapped” – an encouraging sign for CAGE and our allies. The report was featured in a number of feature stories including the Guardian – as well as Open Democracy, Alternet, and Ceasefire magazine. It also prompted a major feature in the Independent. The joint letter itself was a resounding success – CAGE managed to gather an impressive 150 signatories in little over a week. CAGE’s allies in the academic community came out strongly in support of the report, calling into question the perceived ‘science’ behind ERG22+. Allies among student groups used the report to renew their calls to scrap PREVENT. Our allies in the Muslim community also renewed their opposition to the policy. As mentioned previously, PREVENT provides the ‘best practice’ example for CVE programmes in other countries and the British experience is consistently cited as leading the field in counter-terrorism. This report raised several eyebrows across the Atlantic and in Europe, and provided our international allies with crucial information needed to challenge unpopular CVE programmes in their countries. Such an admittance cuts straight to the heart of the issue: a counter-terrorism programme, indeed a whole industry, should not be built around predicting behaviour based on dubious ‘science’, which was never meant for such broad rollout anyway. Our report adds impetus to our call for PREVENT and its shadow CVE programmes, to be scrapped in favour of a more just, open and equitable national and global society. The questions raised by the report remain unanswered one month after its publication. The ERG 22+ remains an unscientific and flawed basis to asses risk of radicalisation. Key questions over the Home Office’s claim that the ERG22+ ‘study’ was peer reviewed must still be answered, not only to establish the truth behind their claims but also to maintain the integrity of genuine scientific enquiry. Despite over 150 academics demanding that the Home Office publish the ERG 22+ study to allow for academic and public scrutiny, there is yet to be a response from the HO. A Freedom of Information request filed in August 2016 requesting the disclosure of the study is still awaiting a reply, over a month after the 20 days statutory limit. 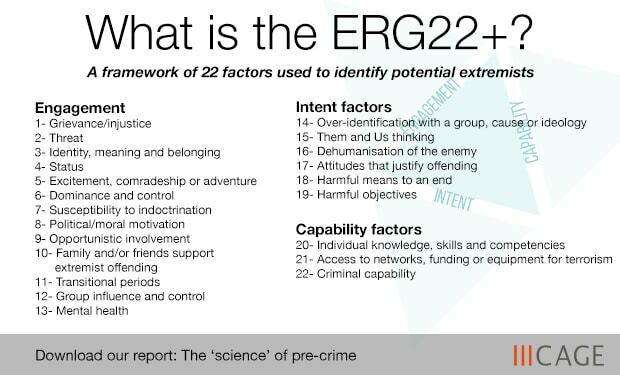 As if the public needed more convincing of the unethical basis of PREVENT and its broad implications, our investigations have further highlighted the devastating impact the ERG22+ is having on families. CAGE is due to publish a report to highlight this aspect specifically. Ignoring our concerns and the concerns of the broader academic community, and pushing on with a flawed, overtly securitised policy regardless, shows a disregard for the rule of law and for the long-term impact of this on communities. This should be of grave concern to all of us.